On the 11th November I’ll number each share and ask someone to randomly pick a number. The pull of the ocean was too strong to ignore any longer. Four years prior, they’d circumnavigated the globe on their 33-foot boat, Mariah. Now they wanted a new challenge. So they sold all their belongings and flew to America from New South Wales in search of a boat. Then Jackie and Noel set sail south, meeting descendants of the Bounty mutineers on Pitcairn, taking in the grand statues of Easter Island (the remotest inhabited island in the world) and making lifelong friends in Suwarrow. Along the way, they lost a friend and came nail-bitingly close to losing their new boat. But they gained so much more. This is a story of storms of emotions and oceans, travel, love, and relationships, and two people figuring out life and fulfilling their need to move and be challenged. Categories: Cruising, Cruising Clinic, Life on board, Life's Little Escapades, Loving life, On the water, Writing Woes & Wins | Tags: amazon, Audible, audio books, best-seller, Christmas gift, circumnavigating, freedom, kindle, living life to the full, prize, sailing, win, writing | Permalink. You can be whisked off to Easter Island, Suwarrow, and Pitcairn while driving through rush hour traffic, relaxing on the lounge, or working on a mindless task. Not only does this book have a new narrator, but a snazzy-new cover too. My publisher, New Street Communications trawled through my photos and came up with the perfect picture of me doing what needs to be done to boats! Narrated by the wonderful Caroline Doughty, you can join me onboard our sailboat Pyewacket II as we traverse the bejewelled Pacific Ocean, riding the troughs and peaks. With six-and-a-half-hours of breath-taking adventures – you can indulge in storms of emotions and oceans. Do let me know what you think. Categories: Life's Little Escapades, Writing Woes & Wins | Tags: amazon, Audible, audio books, bestselling books, Christmas gift, freedom, happiness, iTunes, kindle books, life, sailing, this is it, travel, world | Permalink. Are Audio Books The Future? What do you think of audio books? A great new website has been launched for Audio Books. Do you listen to books? For me it means I can indulge in stories while driving, sanding, painting or just trying to turn my mind off and visit somewhere else in the world while snuggled in bed. Many people have told me that audio books are the future – what do you think? Amazing Audiobooks is a great website – do take a look. Categories: Writing Woes & Wins | Tags: audio books, authors, best books, best selling, kindle books, listening to stories, sellers, writing | Permalink. Audio Books – Do you like them? Great news arrived in the Parry house(boat)hold yesterday. A few weeks back I announced that my publisher is producing This Is It – 2 hemispheres, 2 people, and 1 boat in audio format. Yesterday, I received the news that A Standard Journey – 5 horses, 2 people, and 1 tent, is also going to be in audio format too. These things take time, finding the right professional reader and production – it has to be just right. All my books – aside from Cruisers’ AA (accumulated acumen) (for obvious reasons!) will be available in audio format soon – Of Foreign Build – From Corporate Girl to Sea Gypsy Woman – already is! Later this year I am sure I will have plenty of giveaways! Do you like audio books? Categories: Life's Little Escapades, Writing Woes & Wins | Tags: audio books, horse riding, living life to the full, memoirs, riding, sailing, travelling, trekking, world travel | Permalink. is now available on Audio. New Street Nautical Audio is proud to announce its publication of Jackie Parry’s superb Of Foreign Build: From Corporate Girl to Sea-Gypsy Woman, already a bestseller in digital and paper editions. After suffering an emotionally-brutal bereavement, Jackie made a bold decision and stepped into a new life. With a new husband, and no prior experience with boats, she entered the obscure but fascinating nether-world of the cruising lifestyle. Her world would never be the same again. A floating home with no fridge or hot water, and a dinghy instead of a car. The first off-shore voyage took Jackie into a ferocious storm, which battered her physically and mentally. But amid those raging seas, Jackie shed the fear she’d been harbouring. Soon she was blissfully voyaging around the world, but she still carried the mixed emotions of losing one man while falling head over heels in love with another. Not only did Jackie deal successfully with the challenges of her new existence, she also battled with the testosterone fuelled nautical world to become both a professional captain and a qualified maritime teacher. Most importantly, Jackie found herself. Narrated by Britain’s Michelle Michaels, the New Street Nautical Audio edition for Of Foreign Build runs 14 hours, 43 minutes, and is available from Audible, iTunes, and Amazon. (Listen to an excerpt here). ABOUT THE AUTHOR: Originally from the UK, Jackie Parry is now an adopted Australian. But it’s hard to pin Jackie’s location down at any given time. 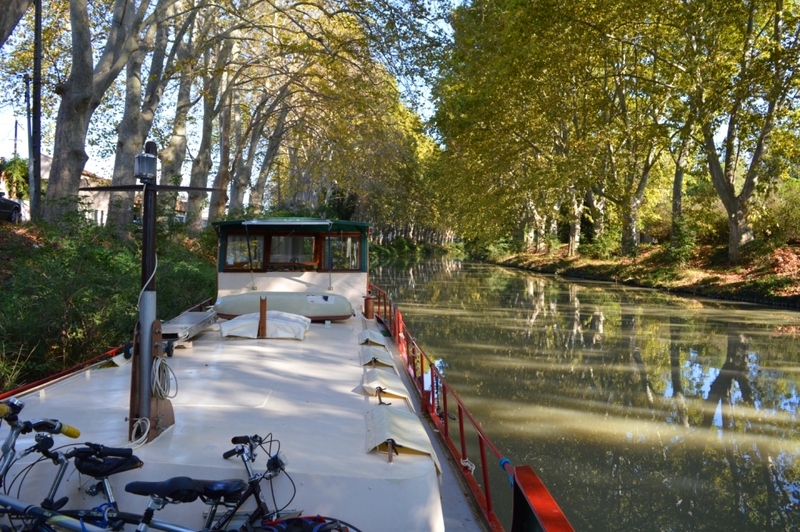 She’s currently exploring French canals on a Dutch barge with her Australian husband. Categories: Writing Woes & Wins | Tags: audio books, bestselling book, challenges, Cruising, indie author, inspiration, lifestyle, new life, sailing, travel | Permalink.